Branding is for cows. 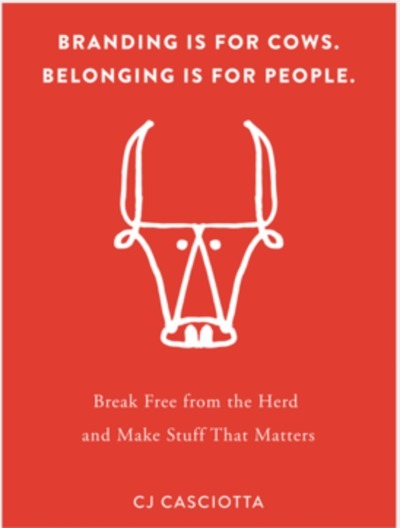 Belonging is for people is a short eBook aimed at those who wish to ‘make stuff that matters’ and reach people in meaningful ways. In it, brand and leadership developer, CJ Casciotta describes the differences between ‘branding’ and ‘belonging’ and argues that the latter is the way to go in today’s world. Conceding that while we sometimes crave ‘instant’ and are willing to make sacrifices for it, Casciotta offers movers and shakers an alternative way in which to engage potential customers: move away from traditional branding and offer your customer an opportunity to belong. Likening the marketing process of branding to the branding and earmarking of livestock, Casciotta suggests that traditional methods of brand creation may fall short because they fail to value and serve the identities of potential customers. Outlining the difference between a ‘doing’ culture in which success is measured by how much we do (regardless of the potential cost to ourselves, others, and the world in which we live) and a ‘belonging culture which emphasizes identity and relationship, Casciotta urges readers to forsake mission statements in favour of powerful manifestos. Casciotta’s perspective is honest, refreshing, and motivating: it isn’t about getting the people to connect with us, it’s about us getting connected with the people. Rousing as it is, the book offers no concrete ways of doing this. It would, however, serve as a useful introduction to doing things differently. You can purchase the eBook at Sounds Like A Movement or download it from NOISETRADE and leave Casciotta a tip. What's your favourite horror classic?